First of all I think I should explain that this DVD does not contain two movies, but two different cuts of the same movie. Night of the Demon is a British horror movie from 1957. Based on M. R. James’ short story “Casting the Runes”, the movie was fimed at Britain’s Elstree Studios and has a runtime of 95 minutes. 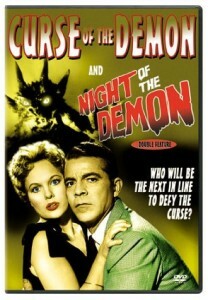 The length of the movie was cut to 83 minutes for the American market and re-named Curse of the Demon, but the original (uncut) version is generally agreed to be the better of the two. Night of the Demon begins with a scene where a distraught-looking British professor, named Henry Harrington, is rushing to the home of a man called Julian Karswell, who is the leader of an occult society. The professor has been conducting a well publicised investigation of Karswell and his society. Karswell, unhappy about the unwanted publicity, has summoned a demon and sent it after the professor. By the time the professor bursts into Karswell’s home he is a firm believer in the powers of darkness and is willing to do anything to save himself from the impending death the demon offers him. Karswell hears the professor out, but informs him some things are easier to start than they are to stop. He then enquires if the professor still has the slip of parchment he gave him. The parchment had runic symbols written on it that mark the professor as the demon’s intended victim. The professor tells him he no longer has the parchment because it flew into the fire. Seconds later the clock on the mantelpiece strikes out the hour (9 pm), Karswell begins to look quite nervous, and it is obvious time is running out for the professor. Karswell assures Harrington that he will do what he can, but seems anxious to be rid of him—and who wouldn’t be with a demon on the way? The professor seems much relieved by the time he arrives home, but as soon as he gets out of his car he sees the demon coming for him, manifesting from a cloud of billowing smoke and towering above the trees. The professor’s time has run out and he dies a horrible death. American Psychologist, John Holden, takes over the investigation. He also attends the professor’s funeral, where he meets the dead man’s niece, who warns him to stop the investigation. Joanna Harrington is an educated woman, but she is also an open-minded woman who has read her uncle’s diary, believes in the forces of darkness, and does not want Holden to share the same fate. Holden remains sceptical, but he seems more than a little impressed by Peggy; so romance is in the air. Now that Holden is in charge of the investigation Karswell contacts him and tries to get him to drop it. Holden refuses and soon receives a piece of runic parchment of his own. He has three days to stop the investigation or he will die at 10pm on the 28th of the month. As the demon gets closer though, even making an appearance in the woods, Holden starts to have doubts about his beliefs (or lack of them) and, as the last hour approaches, he finally accepts the truth and rushes to find Karswell so that he can attempt to pass the runes back and return the curse along with them. Night of the Demon is a great story and the actors do a wonderful job of bringing it to life. The special effects are pretty good too (for a movie made in 1957) and the way the demon materializes from a cloud of smoke is particularly memorable—and it’ a rather scary-looking demon as well. The scene where Karswell causes the windstorm is also memorable as are the scenes where the slip of parchment tries to escape from Holden and into the fire. Night of the Demon is a classic and they don’t come much better, several DVD options are available, but this disc (containing both versions of the movie) is only available in region 1 format. Blu-ray options were not available at the time of this review.